Brilliant album from London-based international pop duo Pipas features ten new tracks that will undoubtedly help strengthen the band's genre-melding reputation. Successfully combining harmonic indiepop with dance music, band members Mark Powell (ex-Bella Vista and Moonlings) and Spanish native Lupe Nunez-Fernandez team up with an ingeniously programmed drum machine to create infectious popsongs which manage to be both unpretentiously simple and naturally sophisticated. 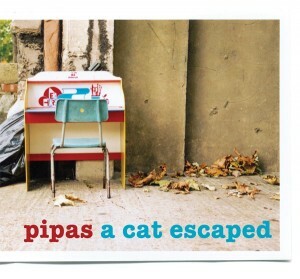 "A Cat Escaped" is a tantalizing treat of modern sounds and guitars that jangle in all the right places, with short, sweet songs and breezy vocals featuring plenty of ba-ba-ba's. The band has developed an avid international fanbase on the strength of previous releases "A Short Film About Sleeping" on Matinée and "Chunnel Autumnal" on Long Lost Cousin, plus a clutch of celebrated live sets in England, Scotland, Sweden and Spain. This highly anticipated new album will delight Pipas partisans and entice new fans.